Roddick Meets The Press In D.C.
After a prolong absence due to injury, Andy Roddick returns to competitive play at the Legg Mason Classic. The three time champion at this ATP 500 event held a news conference this afternoon. As expected, there were a flurry of questions regarding his disappointing lost at Wimbledon. 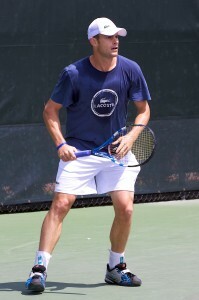 But the feeling was that Roddick is ready to move to a new chapter and that is his U.S. Open campaign. First off, Roddick made it clear that he has recuperated from the hip injury and does not view it as an issue in the upcoming weeks. Roddick cited that with his being off the court for a few weeks that he ” doesn’t expect to pick up where [he] left off a month ago”. For him, it will be a step by step process with the intention of peaking at the last major of the year. Regardless, Andy would like to get into the winning column again and to take it from there. Turning to Wimbledon, for Roddick, it’s difficult to compartmentalize Wimbledon from the rest of year, in part because the media have been fixated on that. However, Andy iterated that Wimbledon in essence was the reaping of the hard work that he put in all year. This has been evident with the results he has posted since January. With Wimbledon, “I don’t know if I gained confidence from that [final].. Although it does help”, Andy emphasized that it has been “building all year”. Contrary to what people might think, Roddick does not focus on the backhand volley that he missed since it was a lot harder than it appeared: “I thought it was going long, and reacted late.. It wasn’t like I was trying to hit a ball to the ocean from the beach and missed. To be honest, I have not thought about it that much. . . [The defeat was] yep heartbreaking, at the same time, not a lot of people get to play for that title. . . That part is never lost on me. Ten seconds after the final I still realized that it’s pretty special thing”. Although Andy admits ” it hurts losing after two weeks of hard work, knowing that your defeat came at the hand of a player that will probably go down as the best ever, it does help”. When asked if he would like to face Federer again, Roddick responded in the affirmative since it would mean that he is deep into the draw. Yet, Roddick’s approach is not to look too far ahead. Although as Andy says he is not “crying in his cheerios”, the pain is still on the surface. When asked “how do you get over the hump of playing such a great match?”, Roddick answered “I will keep you posted”. It has been a season of change for Roddick, “[I’ve] grown up mentally on the court a lot . . . I learned to control any fluctuations in emotions which may have been a problem with [me] in the past. . . I don’t get too up or too down which I was guilty of early in my career.. I try to keep an even keel”. The on court maturity has been reinforced by his recent marriage Roddick confessed. With age, there’s a “normal [evolutionary process that one]” goes through, the sole difference is that he has undergone it in the spotlight. Also, Roddick has come to realize that improvement comes with time, that “transition is gradual”. After the 2008 Wimbledon, Roddick says he was at a low point, his career had deviated on the wrong path. At a crossroad, with injuries, self-doubt crept in. The determining factor that pushed him to change his game was first deciding that he wanted to continue being a tennis player. For Roddick, it meant thinking “what avenues have I not explored”. This led Roddick down the road to paying attention to fitness and nutrition, coach Larry Stefanki has been a tremendous asset in those departments. While Roddick’s frequent coaching changes have been fodder for the press, Andy says “it’s significant but no more so than a NFL team [doing] so”. Instead, Roddick regards it as part of the process of getting better . With Stefanki, the atmosphere is “pretty professional, a lot more organized” which Roddick values. One aspect of Roddick’s game he says has benefited this year has been movement, which has translated into confidence in shot selection and execution. With each coach, regardless of the era in which the person played in, that person brings a vast knowledge to the table. Tennis equipment may have changed but “a great tennis mind is a great tennis mind” which has contributed to his development. With the U.S. Open commencing in a few weeks, Roddick was asked whether he feels weighed down by expectations after his Wimbledon performance? Anything similar to what Andy Murray dealt with in England? Roddick stated that he is grateful that he has never had the sensation of being in a “fishbowl’ like Murray during the month of Wimbledon. Not nearly, the same pressure. In the unique manner that solely Andy can convey what Murray mania was like: ” he had a power bar at 3:16, went to practice at 3:30[they analyzed whether that] was a good move . . . Murray was front page news in the sports for 45 days. . .I don’t think it’s the case for me”.